This article continues the series reviewing streetcar service on the King Street Pilot area between Jarvis and Bathurst Streets. Previous installments are available here. Except for two major storms, April 2018 continued more or less in the pattern of previous months. Schedule changes in mid-May will reduce the scheduled travel time across the route, and this should reduce queuing at terminals. However, it could also lead to an increase in short-turns when the line is under stress. This is always a balancing act in schedule design. Because of this, I will not publish an updated headway reliability article this time around, but will return to that subject later in the year when a few months’ experience with the new schedules has accumulated. The charts in this article contain the same data as in the March versions with the addition of April 2018 data and a few cosmetic fixes. Updated May 11, 2018 at 10:10 am: Capacity charts reformatted to correct headings and date ranges. No change in content. 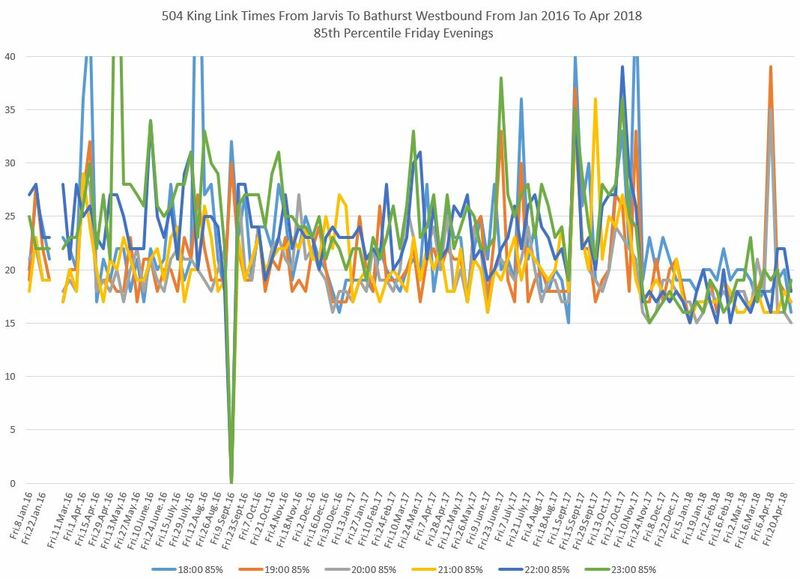 Although there was a considerable reallocation of streetcars between routes during the ice storm, and heavy rain generally fouls up traffic, neither of these events shows up as a major effect on travel times in the pilot area. The uptick in mid-April falls on the 18th, not a storm day. This was caused by congestion westbound at University Avenue, typically the result of cross-traffic not clearing the intersection. This was a Blue Jays home game day. Unusual events visible in these charts are listed below. Note that there are several cases where short-term congestion pushes up the 85th percentile value, but not the 50th percentile showing that this affected only part, but not all of the service. On the charts, this shows up as a case where the orange line (85%) moves upward but the blue line (50%) does not. 8-9 AM, Wednesday April 11: A collision at University Avenue caused service to be diverted between York and Spadina WB. Most EB service was held for the duration of the delay. 8-9 AM, Friday April 20: A “stalled streetcar” at Spadina held service for over 20 minutes WB, and caused shorter delays to EB service, although it is not clear how. 1-2 PM, Monday April 9, WB: A collision at John Street caused service to be diverted between York and Spadina. 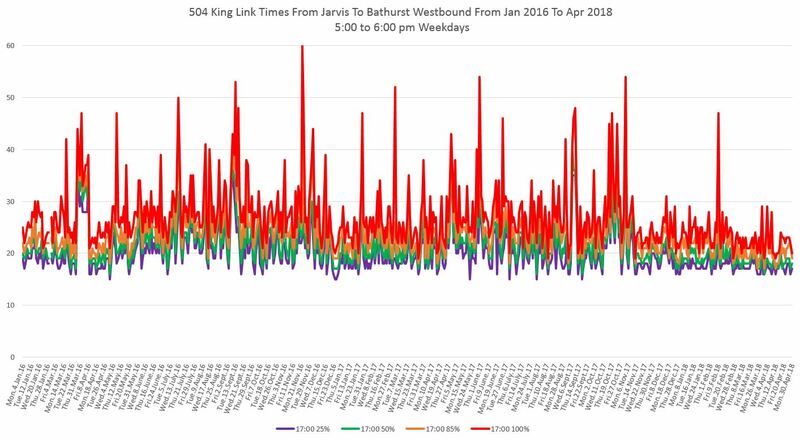 1-2 PM, Monday April 16, EB: Congestion between University and Jarvis between 1:40 and 2:00 pm pushed up the 85th percentile value. 1-2 PM, Thursday April 19, WB: A delay west of Yonge pushed up the 85th percentile value. 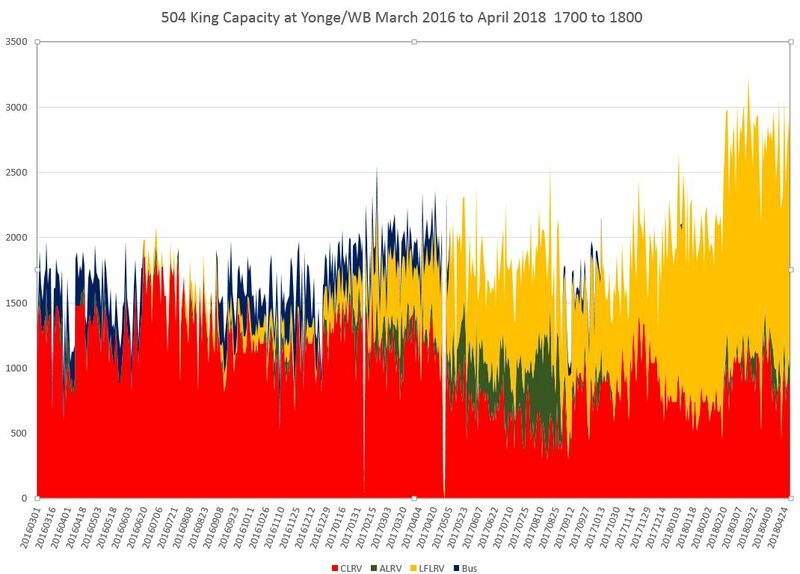 5-6 PM, Wednesday April 4, EB: Congestion between Yonge and Jarvis pushed up the 85th percentile value. 5-6 PM, Thursday April 19, EB: Congestion at Spadina pushed up the 85th percentile value. 10-11 PM, Monday April 16, WB: A collision at Charlotte Street held service for about 15 minutes. The proportion of service operated by the larger Flexity cars did not change much in April, and so there is little change in the capacity of service actually provided. 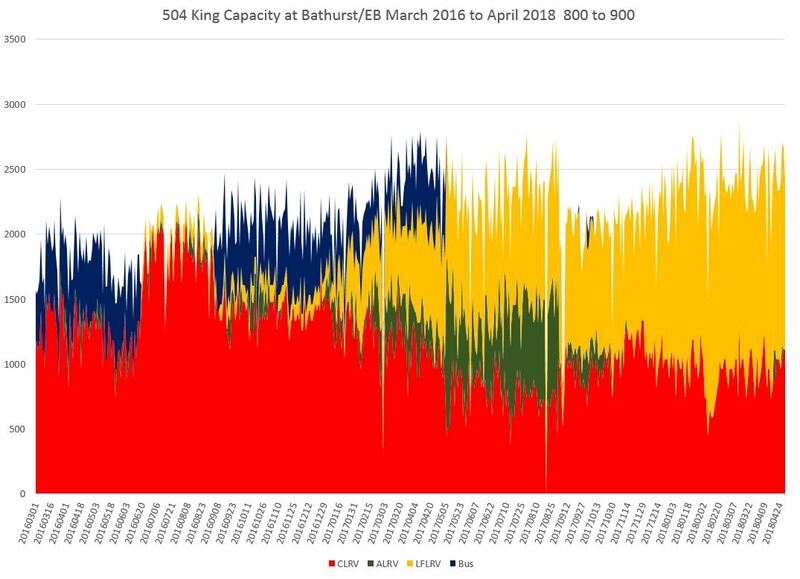 The following charts show the actual capacity (based on service design values of 74 for CLRVs, 108 for ALRVs, 130 for Flexitys, and 51 for buses) for AM Peak service eastbound at Bathurst, and PM Peak westbound at Yonge. As in March, over half of the capacity provided in the central part of the route is with Flexitys operating on 504 King and 514 Cherry. The jump in capacity westbound at Yonge in mid-February is due to the introduction of the 503 Kingston Road service operating west to Spadina which is provided by CLRVs. The 503 is not included before this change because the buses operated westbound via Wellington and only went to York Street. This set of charts presents four sets of percentile values for the travel times. The degree to which the red 100% line and the purple 25% line stay close together shows the consistency (or not) of travel across the pilot area. This has been consistently better since the pilot began in mid-November. The green line shows the median (50th percentile) values with half being above and half below, while the orange (85th percentile) show the upper bound for trips as seen by most riders. This example shows travel times from 5-6 pm westbound through the pilot area. The full set of charts for each direction with data for five separate time periods is linked below. The travel times vary considerably by day of the week and time of day. The chart sets below show the percentile data for both peak hour and for late evenings separated by day. The marked reduction in travel times in the late evening continues into April, but these values have been rising as the weather improves and activity builds up in the Entertainment District. All of the preceding charts look at specific hours of service through the day, but in the sets that follow, the 85th percentile values are shown for each hour so that the evolution of values through the day can be seen. Improvements are not confined to the peak periods, especially on weekend evenings when congestion in the Entertainment District has been reduced. 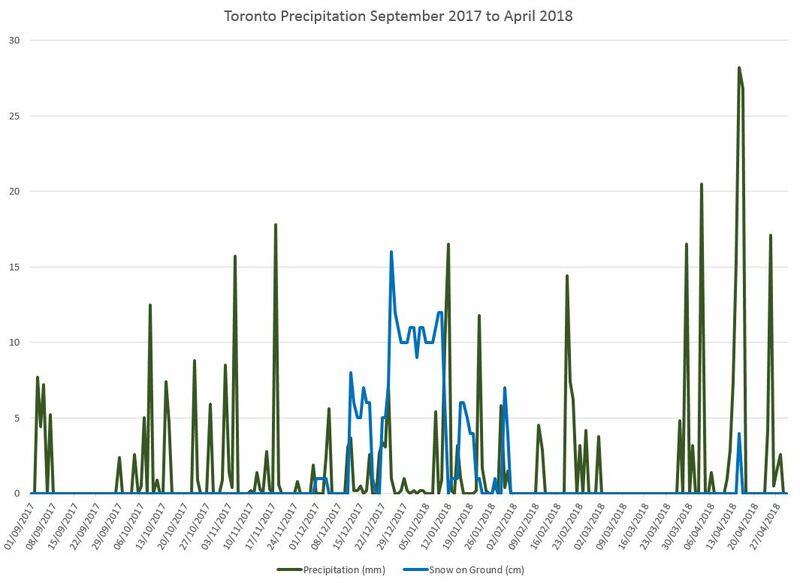 In the chart below, the spike on Friday, April 6, 2018 in the 7-9 pm period (19:00 and 20:00 lines) was due to a medical emergency east of Yonge Street that caused service to divert westbound between Church and Spadina. The delay spanned the period from about 7:40 to 8:30 pm, and several trips were affected in both hours pushing up their 85th percentile values. Any update on the status of TSP implementation? While various and generally minor changes to signal timing have been implemented or are planned, the most significant from your perspective would likely be the restoration of Transit Signal Priority at King Street and Bathurst Street. This change has been in response to observed delays at that intersection, which is an intersection of focus given that it is at the end of the Pilot area. 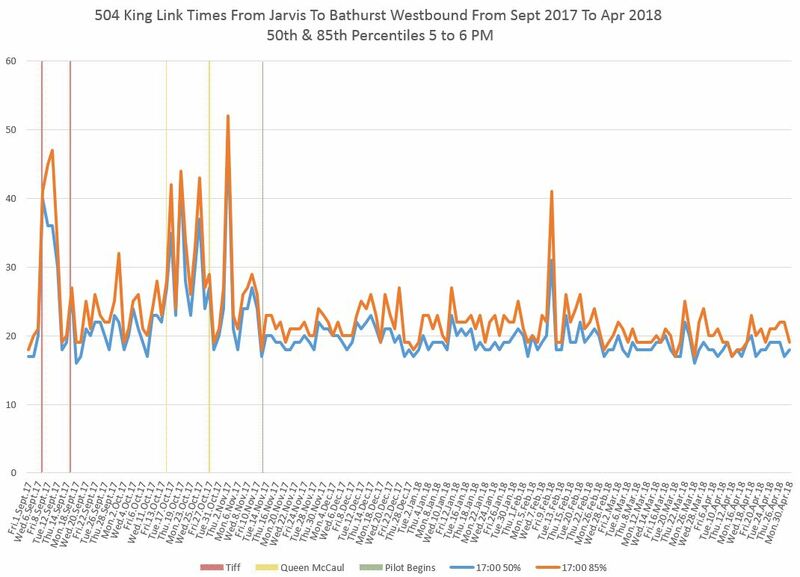 I have not yet looked at the April data in detail to see whether there was a change in travel times through the Bathurst intersection.